Finally came the day to pick up our puppy Lagotto Romagnolo. It is a special day for the family who adoptes the puppy. After so much waiting and preparations the day is finally came and the family is increased. It’s a special day for us too. By one side we have a little displeasure for the detachment from the puppy who we have grown since the first moment of his life. On the other side we are happy for the family who adopts our puppy. In the new house often he is the only curly child. It is inevitable and even right that it is so. We must not forget, however, today is also the day the puppy leaves the brothers and mother and also us. The family on two legs that with love and patience has always found close to him. 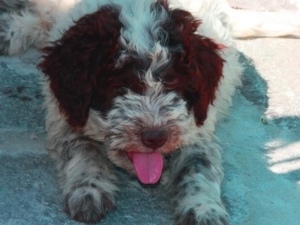 We are sure soon he will be a very nice Lagotto Romagnolo. We worked hard because he was ready to face this moment and start his story. Our puppy often immediatly understands what is going on, and a little tension we see appear in his expressions. A tough day for our puppy. The first trip in the car, the new house and the new friends, all in one. Today is the puppy’s day, he is the protagonist and all the others come after. Let’s get ready for the trip. If we will have a long journey we will need a dog carrier. Conversely the trip may be an opportunity to pamper and reassure our puppy. Holding him in ours arms he will understand soonly that all the attentions now are only for him. On arrival at home we will let find to him a dog bed where he could feel himself comfortable. The water bowl must not be missing. For feeding we recommend to continue to give him the kibble we use in the weaning phase. The changing feeding is the reason of intestinal discomfort that is best avoided. The feeding must be specific for puppies and hight quality. A blanket or a fabric game can help for the first few days and during the trip to feel less detachment. We will rub the blanket over the mother so that the smell can be something familiar. In the following days we will have to respect his moments of rest. The children will have to placate their enthusiasm and we will always privilege the serenity and tranquility of the Lagotto puppy. The next days upon the arrival at home. We will proceed by degrees, without haste in all new situations. The puppy will soon have to assimilate the rules of the family. Everyone will have to keep the same attitude especially on the wrong behaviors. Soon we will begin to let him know the world around him. Short moments to meet new humans and new furry friends. 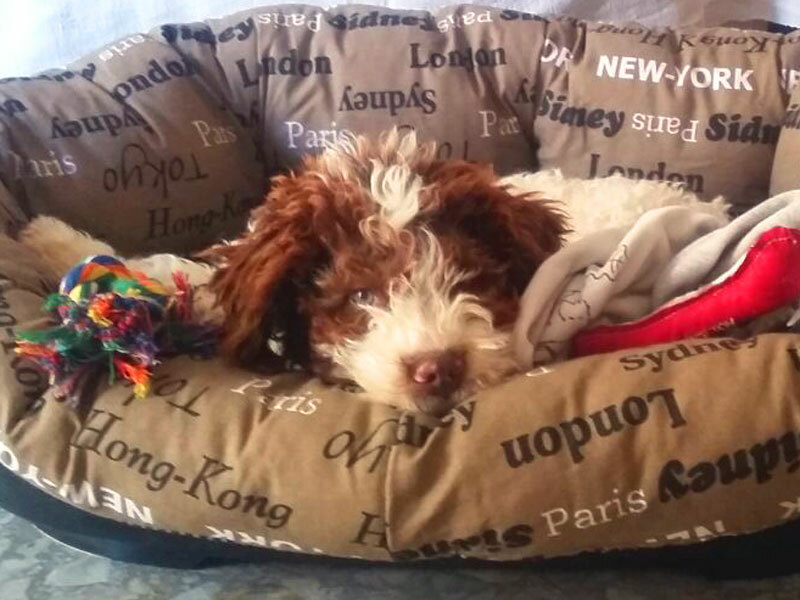 We must not exaggerate, we will have time to let everyone know our wonderfull Lagotto Romagnolo. We will be carefull to the safety of the puppy when he facing new situations, self-esteem must not fall. Better stop! Our puppy Lagotto play with other dogs is fun for him and also for us. There are many stimuli the puppy receives in these moments. Experiences that contribute to the formation of character and socialization. Evalutate age, tonnage and temperament of our puppy’s playmates is a must. The pupies often plays lively and it can be dangerous for him. Its bone structure is not fully developed and could be in risk by exaggerated movements or by blows received playing. The puppy can attend only dogs definitely vaccinated until has notm concluded the protocoll of vaccines. Up to 4 months the period of formation of the puppy character is not concluded. Each experience, better if it is positive, contributes to the formation of the adult dog’s character. To teach the puppy not to do the needs at home we will need of patience and constancy. Only one recommendation: do not grumble the puppy up to 4 months of age. Puppies don’t controll these needs. Grumbling or having intimidating attitudes, will only help you to have a bad relationship with yours Lagotto Romagnolo. 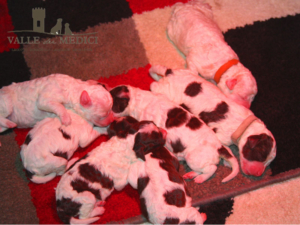 Have a balanced Lagotto Romagnolo it will be fantastic, in the next future!